Cold winter winds may make you shiver, but wind chill doesn’t impact our plants the same way. Wind chill is a measure of how cold we feel based on wind speed and temperature. This impacts humans and animals, but our plants only respond to the actual ambient temperature. Winter winds do, however, impact our plants. Wind can dry evergreen foliage and stems causing browning, dieback and death. This is a bigger issue in winter since the air is drier and ground may be frozen. Prevent winter damage by watering plants thoroughly before the ground freezes and spread a 2 to 3 inch layer of mulch over the soil surface. Pull it back from the trunks of trees, stems of shrubs and crowns of perennials. Use discarded Christmas trees, fabric or decorative fencing to create windbreaks. This is especially important around broadleaf evergreens exposed to winter wind and sun. 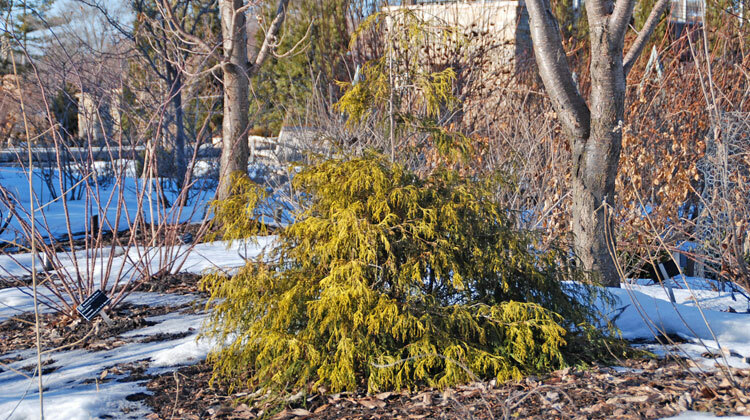 A bit more information: Many evergreens do not show signs of winter damage until temperatures warm in spring. Monitor the development of browning leaves and dying stems to determine if it is winter damage or a disease. Diseases typically appear on a portion of the branch or plant and continue to spread. Winter damage is usually on the portion of the plant exposed to the winter wind and sun and does not spread to other parts of the affected plant.